This week in Québec City the Twenty-Eighth AAAI Conference is being held and for the fourth year running there is a special track on Computational Sustainability. The range of talks look at ways to apply and extend ideas in Artificial Intelligence and Machine Learning for solving complex problems in Electric Vehicle Management, Bird Tracking, Disease Mapping, Power Management and Urban Emergency Preparedness. You can see the full abstracts for the talks from the whole conference including the CompSust track online here. Also, if you subscribe or have access to AI Magazine, the magazine publication for AAAI, you can see some high level articles in the next two issues on the range and depth of CompSust research. If you have research in this area that you want to submit then you’re in luck, due to AAAI changing it’s schedule from summer to winter the next AAAI CompSust deadline is just five weeks away! (Abstract:Sep10, Paper:Sep15) (Ok, so it’s a good thing if you have something ready to submit.) Good luck! 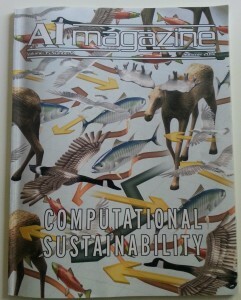 Topics in Sustainability and Artificial Intelligence of articles in the special CompSust 2014 issues of AI Magazine.